To view subscription details simply go to Billing → Subscriptions in your Stripe dashboard. Here you will see a list of your most recent subscriptions and can filter or navigate to find specific records. Some of the subscription details can be edited as needed by clicking the “Update Subscription” button at the top, including adding or removing pricing plans, prorating changes, applying a coupon, adding tax and adding a trial period. Underneath the subscription details is the subscription Metadata. The WP Simple Pay Item Description will be automatically added here with the label “description”. WP Simple Pay will occasionally add metadata for internal use as well, such as for Installment Plans. Any other metadata can be added or modified just like custom field values. 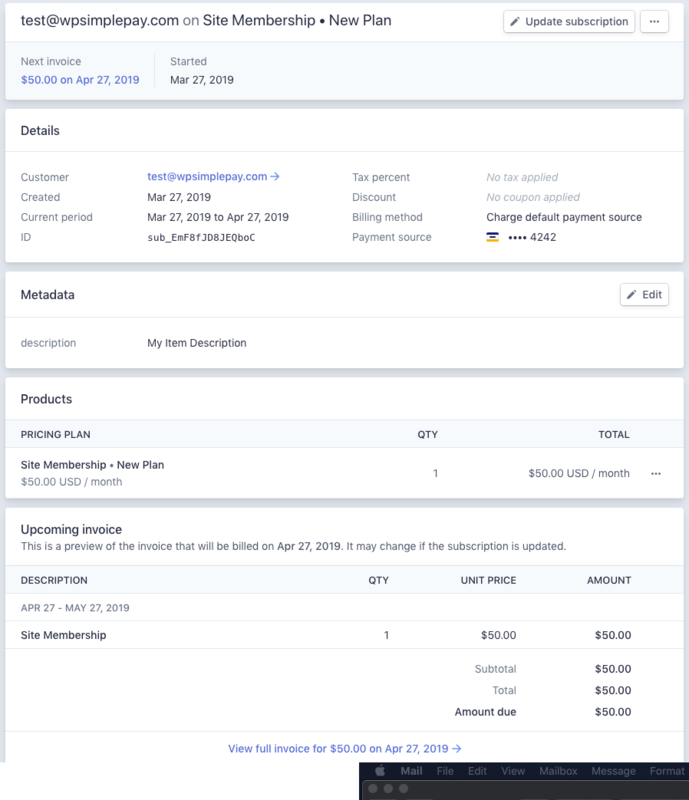 Under the metadata, you’ll find all information about paid and upcoming invoices tied to this subscription as well as any discounts applied, such as if you added a coupon in Stripe and a coupon code field to a subscription payment form.